I'm putting together the accounts of all our canal trips. Have a look, you should find something to interest you - and keep looking, as I'll be adding more pictures both new and old. Our plans for a 2017 trip were drastically changed when Debbie broke her wrist after just a few days, and we returned to the canals while she recovered. We spent an utterly glorious few weeks on the River Thames before heading up the Shroppie to the Anderton Lift for a few days on the River Weaver. Then it was back up Heartbreak Hill and along The Macclesfield and Peak Forest Canals before leaving the boat in King's Bromley Marina for the winter and spending our 2017 Christmas in the Staffordshire countryside. In 2018 our plans were constantly changing again, as not only did we have the opportunity of a last-minute cruise across Europe but also we were frequently affected by extremes of weather - both hot and cold - plus water shortages and an embankment breach at Middlewich. Despite this we managed an extensive cruise which took us more than 1250 miles via Birmingham, Worcester, Gloucester, Llangollen, Stoke-on-Trent, Macclesfield, Braunston, Oxford, Windsor, Lechlade, and Leicester - to finish back in the Staffordshire countryside for Christmas again. To help you find your way around this site as it continues to grow, as well as the comprehensive index you will see a navigation bar at the top of this page as well as on our home page. You can click directly on to any of the 6 headings or you can click on any of the sub-menus that drop down from them. This navigation bar should help you to find any one of our journeys, as well as taking you directly to many of the more spectacular places that we have visited. All the pages are packed with pictures; I hope you enjoy them. The pictures are shown as thumbnails to help the pages load quickly, but clicking on any picture will bring up a larger version. The photos are all available at higher resolution so e-mail me if you'd like any of them sent to you or if you'd just like to get in touch. You can still look below for the list of all our recent trips, as well as some reminiscences of boating in the 1940s, of the River Shannon and the Norfolk Broads in the 1960/70's, of the canals in the 1970's, and all our trips on Thistle from 1987-1991 including our spooky encounter with the Kidsgrove Boggart at Harecastle. After many years of hiring since the 1960's we bought "Thistle", an old Harborough hire-boat with a highly varied and highly chequered history. She had been declared to be a sunken ship, then when she really did sink she was lifted up and cut in half. Now you can read her fascinating story for yourself. We loved her dearly, and in four years she took us all over the country, including trips to Llangollen, London, Lechlade, Leicester, and across the Leeds & Liverpool canal as well as plenty of places that don't begin with a letter "L" such as Chester, Stratford-on-Avon, and the Curly-Wyrley around Birmingham. Now she has a new lease of life, having been beautifully restored. 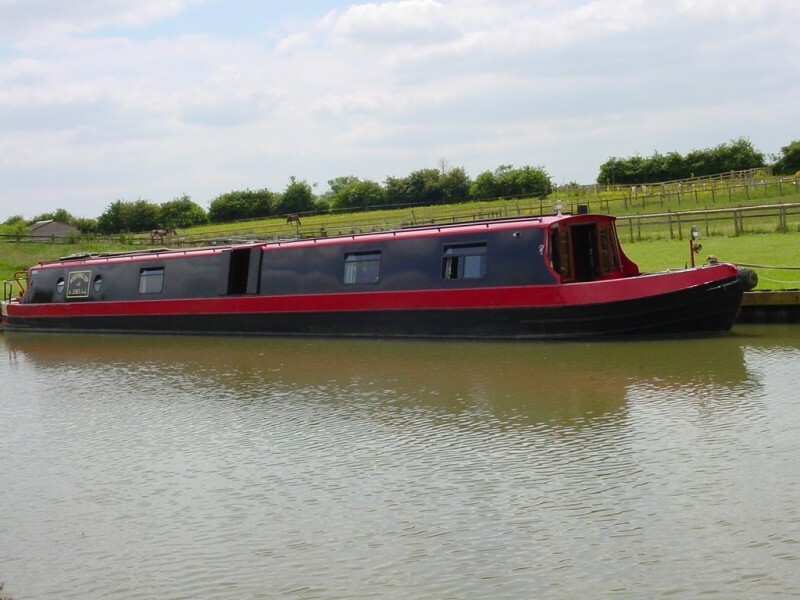 In 1991 we commissioned Stoke-on-Trent Boat Building to build our new boat 'Keeping Up': steelwork, woodwork, fittings, the lot (except the curtains. Stoke-on-Trent didn't do curtains). You can read all about her construction and see the pictures that we took at every stage of the work. She is 67 ft long, built of top-quality steel with a half-inch thick base plate, and painted the same distinctive red-and-black design that 'Thistle' had become so famous for. With a 42hp Duffields Perkins engine she performed magnificently until in 2014 the engine became too tired and was replaced with a new 43hp Beta Marine engine. and at the time of writing (2016) she has taken us more than 25,000 miles all over the country. The picture shows 'Keeping Up' on her home mooring at Milton Keynes, just south of our home at Milton Keynes. The National Waterways Festival was held at MK in 2001; I've captured some of the sights and sounds of the working boats for you to enjoy. Here is a list of all our canal trips on Thistle and Keeping Up. We have a detailed log of all these, as well as our hire-boat holidays since 1980, and all the interesting ones will appear on this site eventually. There are plenty of pictures included, but please note that to save space and minimise download time, these have all been stored at a slightly reduced quality- if you would like a full-quality copy of any of the pictures - or if you have any other comments - please e-mail me. Milton Keynes - Braunston - Hawkesbury - Fradley - Nottingham - Newark - Keadby - Stainforth - Leeds - Skipton - Wigan - Worsley - Preston Brook - Middlewich - Stoke-on-Trent - Fradley - Hawkesbury - Braunston - Milton Keynes. Including a close encounter with Kit Crewbucket. Leighton Buzzard - Crick - Foxton - Market Harborough - Foxton - Crick - Braunston - Warwick - Braunston - Leighton Buzzard. Sunk as a ship, sunk as a restaurant, cut in half; what else can happen to her? Can't remember this one at all, I'll have to work it out from the photographs!